The length of time between these two donations would indicate that they had a long and close relationship with the town for many years. Thomas Agnew Ansdell was an actor and producer, stage name 'Thomas Brough'. The Brough brothers were well-known actors and playwrights who were connected in Victorian society with people such as Charles Dickens and Mark Lemon, the editor of 'Punch' magazine, which was owned by the Bradbury Agnew family. They were also members of 'The Savage Club'. The Brough family were closely related to Maria Romer, wife of Richard Ansdell. 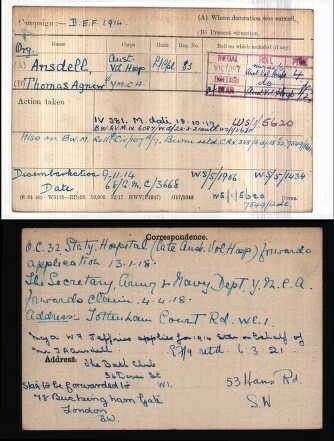 Thomas Agnew Ansdell was born on 7 February 1891 at Beech Hurst, Hope Avenue, Pendleton, Lancashire to Thomas Chester Ansdell and Constance Mary Ansdell (nee Agnew). Thomas Chester Ansdell was the eldest son of Richard Ansdell. He died on 23 January 1966, aged 74, at Quinnettes, Churt, Surrey. Thomas Agnew Ansdell was married in June 1921 at St Paul’s, Knightsbridge, London to Beatrice 'Betty' Frances Clara St John, born 1893 in Brentford, Middlesex, with whom he had 4 children: Thomas, born 1921 (died aged 3 months), Nicholas Agnew, born 1923, Virginia Marguerite, born 1925 and Peter Murray Agnew, born 1929. According to reports in The Times, Thomas and Betty hosted a number of society weddings at their Chesham Place home. Betty died on 29 May 1957, aged 64. Thomas appeared in a number of charity plays in the late 1920s and early 1930s in London’s West End. He engaged semi-professional players and professional make-up artists from London and superb costumes were hired from Brighton. The last pageant, called 'Gloriana', was to honour the Coronation of Queen Elizabeth II in 1953. Thomas sat as an understudy for a painting of Churchill, as he had a similar facial and rotund appearance. After each sitting he received a cigar from 10 Downing Street and in 1952 met Sir Winston Churchill at a dinner given by the Junior Carlton Club who commissioned the portrait, now at Bath Conservative Club. Thomas was a Fellow of the Zoological Society of London, elected in 1914, 1921 and 1923, following in the footsteps of Richard Ansdell and some of his sons. Beryl Constance Ansdell was born on 12 August 1889 whilst the family was still living at Beech Hurst, Hope Avenue, Pendleton. She was married on 30 April 1914 at St James Church, Hope, Pendleton to Charles Philip Leese, who was born in 1889 in Salford, Lancashire. Following her marriage she and her husband moved to Hope Court, Hope Bagot, Ludlow, Shropshire. Charles Philip Leese was a cousin of Lt General Sir Oliver Leese, Chief of Staff to General Field Marshall Montgomery during World War II, who also lived in Shropshire. 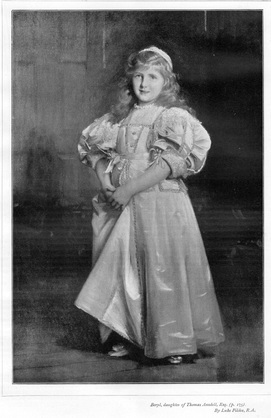 Charles died in March 1947 at Ludlow. Beryl Constance died in 1961 and was buried with her husband.